Floating on a picture perfect lake or moored by the edge of Srinagar's lakes, Kashmir's famous houseboats is the way to see how this place earned the name, "The Venice of the East". The silent atmosphere, breathtaking view and homely comfort gives freshness and renewed energy to any exhausted traveler. 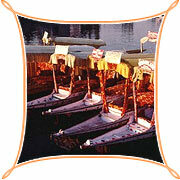 The Dal Lake is famous for the comfortable houseboats as well as the Shikaras. Each houseboat has anything between two and four bedrooms in it with attached bathrooms and a common sitting and dining room. The charges of a houseboat always include all meals and a certain number of crossings by shikara to and from the houseboat. Water - powered peddlers sell everything from saffron to paper mache deer to the houseboat door. Ride a Shikara - a Kashmiri gondola - to the watery vegetable markets and see the mountains mirrored in the lakes. The wonderful houseboat provide the homely comfort, food of your taste and has many options open to your choice such as a shikara ride, sunbathing on the houseboats top-deck, shopping, trekking, relaxing, reading and just being served whatever desired. This unique Kashmiri tradition of gracious waterside living originated with the first British residents of Kashmir. In order to prevent them from assuming power, the Maharaja of Kashmir forbade the British to own land; their solution was to build their residences on water, with the houseboats evolving from modest floating homes to veritable floating palaces. These hand-built houseboats, boasting all the amenities of 5-star hotels, are one of Srinagar's stellar attractions. These enchanting residences range from 60 to 150 ft. long, are 15 to 20 ft. wide and each is unique. There are spacious four-bedroom boats and cozy two-bedrooms; all feature attached bathrooms, electricity and modern plumbing. The cedar interiors are intricately carved and display the consummate artistry of Kashmiri craftsmen. The furnishings include embroidered native rugs and fabrics, local objects d'art, and solidly comfortable Victorian and Edwardian furniture. These luxurious boats also feature rooftop sundecks from which to take in the Himalayan views and enjoy the brisk fresh air. 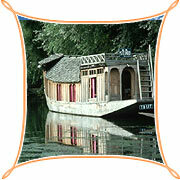 A houseboat holiday is also an unusual gourmet experience. Our chefs will prepare the finest Kashmiri dishes, including barbecued lamb kabobs marinated in fragrant herbs), Rista (juicy, delicately seasoned lamb meatballs), Tabaq maz, fresh saffron rice and Goshtaba, dishes typically prepared only as part of the special Wazwan celebrations. Our chef will also prepare Western style meals to order. Every meal is a festive occasion with the finest local dishes served in classic British style - on linen and lace, with silver and china. Sit back and enjoy desert, firni(a special dessert pudding made of rice, raisins, nuts, saffron and milk) and a pot of Kahwa (our local green tea).